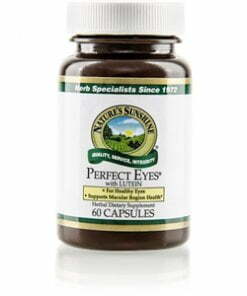 Nature’s Sunshine Perfect Eyes® protects ocular cells from free radicals generated by sunlight and artificial lighting. As the body ages, it produces fewer antioxidants, changing eye pigmentation. The ingredients in Perfect Eyes provide nutritional support to keep the eyes healthy throughout the aging process. The formula includes lutein, n-acetyl-cysteine (NAC), and a variety of herbs. Lutein may slow or prevent age-related macular generation while NAC fights against free radical damage. 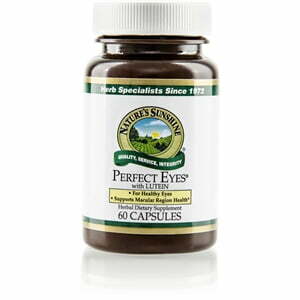 One serving or two capsules of Perfect Eyes supplies 6 mg of lutein.